Sp. 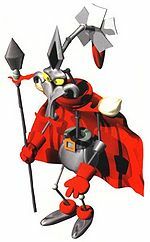 Attacks Pierce, "Glowing Shot"
Yaridovich is a lieutenant of the Smithy Gang in Super Mario RPG: Legend of the Seven Stars, and a master of disguise. He is a shape-shifting robot that is also able to split into multiple copies of himself. However, Yaridovich cannot change colors, and as such, any form he takes exists in shades of gray and red. In his true form, Yaridovich resembles a spear. His name itself comes from a Japanese spear known as a "yari". Yaridovich is shown to be arrogant, boasting about his superiority and high status within Smithy's forces. Yaridovich is charged with acquiring the fifth Star Piece. To trick Mario, Yaridovich kidnaps the population of Seaside Town and imprisons them in a large building, then impersonates them all with his shape-shifting and duplication powers. When Mario arrives in the town, Yaridovich, in his disguise as the Town Elder, asks the hero to retrieve the Star Piece for him. When Mario returns with the Star Piece, Yaridovich, with several of his duplicates, reveals that he is a member of the Smithy Gang and asks that Mario turn over the Star Piece to him; for every time he refuses, he sends his doubles to tickle the Town Elder with a feather until Mario agrees. After he hands it over, Yaridovich and the clones run off to return to Smithy. At the coast, Yaridovich is waiting for Blade to show up when Mario arrives, and when the group tries to swim away, Jonathan Jones appears and blocks their path. With nowhere to run, Yaridovich assumes his true form and battles Mario and his allies. After he is defeated, Mario obtains the Star Piece, as well as the Shed Key that unlocks the building trapping Seaside Town's true inhabitants. Yaridovich returns as a Machine Made, a gray, mass-produced copy of the original. Interestingly, it can split into four Machine Made Drill Bits with the Multiplier! move. Yaridovich can be seen in the parade during the end credits, along with Mack and Bowyer, in which all three are pounded by Smithy's hammer. Yaridovich always starts his battle using Water Blast, and he will use it every three turns. Yaridovich's other special moves include Flame Stone, Will Wisp, and Pierce. Yaridovich's attack and defense are the highest of any story-related boss encounter in the game. However, Yaridovich is weak to Thunder. Every third turn, Yaridovich will use Mirage attack!, which will create a clone of himself. The copy is identical to the original in appearance and is also simply known as "Yaridovich", but it has a different psychopath, different attacks, and lower stats and HP. When the clone has lost all of its 500 HP or after a few turns pass, it merges back with the original Yaridovich. These clones are the only bosses besides Exor that Geno Whirl can do 9999 damage to. Psychopath "I'm not the real McCoy!" This page was last edited on March 5, 2019, at 16:47.